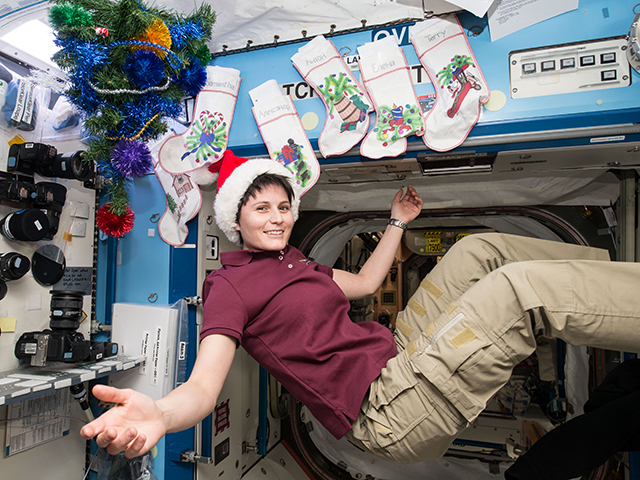 Italian astronaut Samantha Cristoforetti is in the holiday spirit as the station is decorated with stockings for each crew member and a tree. It’s beginning to look like Christmas on the International Space Station. The stockings are out, the tree is up and the station residents continue advanced space research to benefit life on Earth and in space. A wide array of research work took place Tuesday with scientists on the ground, working in conjunction with the astronaut lab assistants, exploring different fields. Behavioral testing was scheduled Tuesday for the Neuromapping study to assess changes in a crew member’s perception, motor control, memory and attention during a six-month space mission. Results will help physicians understand brain structure and function changes in space, how a crew member adapts to returning to Earth and develop effective countermeasures. Another study is observing why human skin ages at a quicker rate in space than on Earth. The Skin B experiment will provide scientists a model to study the aging of other human organs and help future crew members prepare for long-term missions beyond low-Earth orbit. Se eu estivesse condições gostaria de ter essa experiência? Win them all ( the scientific experiments ) and come back ,safe and sound. Thank you all there. Hyderabad,India time ::1330 hrs. This is very interesting. Wanna read testing and test result more. Thank you Nasa for this! Merry Christmas and Happy New Year to All the ISS Crew and NASA!!!!! Merry Christmas to you all. Hope Santa has a space rocket to get to you to fill those stockings. I monitor Spot the Station and wave to you when you’re over my house in VT. Lately we’ve had too much cloud cover to see the evening sky in this region. Just want to wish you all a Merry Christmas or whatever holiday you may like to celebrate. I love the Christmas tree on the ceiling. Keep up the good work. Soy una adolescente de Argentina y estoy absolutamente fascinada!! Quiero ser parte de todo esto y conocer el espacio. Les deseo unas hermosas fiestas y que sean felices, espero algún día ser parte de la NASA! thanks for your bravery service for human being and earth over 300 miles away from earth. god bless you. marry Christmas all of you. Feliz Natal e um ano novo muito feliz, você tem apenas passou sobre nós !! (Ashford, Kent UK) Vê-lo às 19: 00hrs novamente !! Just had a photograph taken watching the Spacestation going over our house in Bolsover, Derbyshire, U.K. When we zoomed in we could see the structure, amazing !!! Our 3 year old nephew thinks Santa is on his way !! Have a pleasant flight and a safe return. Merry Christmas and a Happy New Year to all. Best wishes from the Hall family. It is great to see you are festive. Thanks for making lots of children ‘see Santa on his sleigh’ tonight. If this works and gets to you all on the space station, which is not very likely. Thank you for sending the space station very close over my home in England, on 24th Dec. 2014. It was wonderful to see it. Nice to see you Christmas decorations hung up in the Space Station. Very Happy Christmas to you all. I understand this Christmas gag, but please dont forgett, there are billions of people world wide with different religions, and Space is for and from everyone, and this is International Space Station. and not Vatican Station. (I am not critizising the religion of my parents). Just an opinion. MARRY CHRISTMAS AND THANK ALL OF YOU FOR MAKE THE COUNTRY MORE AND MORE BEAUTIFUL. We gave you a wave from the uk at 5.22pm 24th and 4.33pm 24th December. how bright are your lights!! I bet, that if you watch closely near the window, you will see Santa coming to town….i mean, to earth! Happy Christmas to you all! Merry christmas fron Palestine! Amazing to see the christmas spirit in space! when will be all the people able to go to space station? Merry Christmas to you all , And may the new Year bring all of you Joy and Good Health. That is so cool. Merry Christmas and happy haunakha and have a great and blessed new year. i wish mery christmas and a happy new year for all the hummanity here or in space.Special for the crew many successful missions for all of us. I wish you a Happy New Year from the ISS. crew ! Thank you for saying ‘Christmas’ and not ‘Happy Holidays.’ PC is out of control in America. Happy New Year to all of the crew , and thank you . I hve just been listening to Chris Hadfield on the BBC’s Infinite Monkey Cage , and he spoke of the Space Station Christmas Tree , that its hung upside down , and there it is !!!! All the very best in the New Year to all the crews in Space and on Earth . Me gusta la ciencia las estrellas y quiero trabajar inbentando lo qud no se imbento encontrar lo que no se encontro.